The Khalkha Jebtsundamba Khutughtu (also known as Javzandamba Hutagt in Khalkha Mongolian; also as Rje Btsun Dam Pa or Jetsun Dampa in Tibetan — all meaning lit. Holy Venerable Lord) is the spiritual head of the Gelug lineage of Tibetan Buddhism in Mongolia. He also holds the title of Bogd Gegeen, making him the top-ranked lama in Mongolia. The first Jebtsundamba, also known as Bogdo Zanabazar (1635-1723), was identified as the reincarnation of the scholar Taranatha of the Jonang school of Tibetan Buddhism. History of the JonangpaIn the early 14th century the monk Sherab Gyeltsen broke away from the Sakyapa school and established the Jonangpa school at Jonang, about 160 km northwest of the Tashilhunpo monastery in Shigatse. There, the Jonangpa built a large monastery and constructed a printing press. The Jonangpa school had generated a number of renowned Buddhist scholars, the greatest of whom was Taranatha (1575-1634). Taranatha placed great emphasis on the Kalachakra system of tantra which became an important part of Gelugpa teaching after the Gelugpa absorbed the Jonangpa monasteries. Taranatha’s influence on Gelugpa thinking continues even to this day in the teaching of the present 14th Dalai Lama who actively promotes initiation into Kalachakra. After several centuries of independence, however, in the late 17th century the Jonangpa order came under the attack by the Fifth Dalai Lama who forcibly converted their monasteries to the Gelugpa order. Zanabazar was the son of Prince Tosiyetu Khan, ruler of the Khan Uula district of Mongolia, and himself became the head of the Khalkha Mongols and the spiritual leader of northern Mongolia. The first two Jebtsundambas were direct descendants of Genghis Khan. On the intervation of the Qing Dynasty, which was afraid of Mongol reunification, the rest were chosen from among the population of Tibet. When northern Mongolia began its independence movement, the eighth Jebtsundamba (1869-1924) assumed the title of Emperor of Mongolia, calling himself Boghda Khan (also Bogd Khan or Bogdo Khan). He was the head of state until his death in 1924. The Communist government declared the end of his reincarnation. 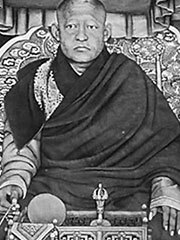 The present Jebtsundamba Khutughtu is Jampal Namdol Chokye Gyaltsen, born in Lhasa, Tibet. At the age of four, he was recognized as the reincarnation of the 8th Jebtsundamba. In 1959 he fled to Dharamsala in India where he now lives in exile. When Tibetan and Mongolian Buddhists sought to consecrate a new spiritual master for Mongolia, a remarkable gift of divination occurred. All omens pointed to the three-year-old son of Gombodorji Zanabazar, who later became the first Bogd Gegeen of Mongolia. In 1640, Zanabazar a direct descendent of the Great Chinggis Khaan, was recognized by the Panchen Lama and the Dalai Lama, as a Living Buddha and was thus, enthroned as the head of the Gelug tradition in Mongolia. Zanabazar rapidly acclimated to his recognition and his youth was accompanied by wondrous occurrences. Given his remarkable ability to combine art with invention, to some he is the Michelangelo of Asia, offering a regional renaissance in theology, language, astronomy, art, medicine, and other spiritual matters. As a religious leader he wrote sanctified music, mastered the sacred arts of bronze casting and painting, fashioned a new design for monastic robes, and created both the Soyombo Script, which according to scholar Ragchaagiin Byambaa, is modeled on Indian Lantsa, known as the Ranjana Script, and the Quadratic Script based on the Tibetan and ‘Phags-pa Scripts. Further, Byambaa suggests that both scripts of Zanabazar were crafted to write in a tri-combined Dharma language of Tibetan, Mongolian and Sanskrit. He phonetically designed his two alphabets to reflect the merged sounds of all three languages more accurately. Used primarily for sacred and ornamental Buddhist inscriptions, it is still occasionally used among learned Buddhist scholars in Mongolia, today.